If you think chocolate chip cookies should be a food group, then you are going to go crazy over these chocolate chip cookie bars. 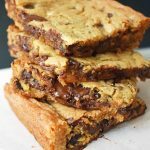 It’s basically classic, buttery chocolate chip cookie dough baked in a large pan and cut into squares. It’s a chocolate chip cookie shaped like a brownie! Be still my heart. These cookie bars are literally gone within minutes in our home. These Chocolate Chip Cookie Bars are made like traditional chocolate chip cookie dough by creaming the butter and sugars for at least 4 minutes. This recipe calls for a good amount of sugar which gives it that ooey gooey texture that melts in your mouth. A hefty dose of vanilla is added for the depth of flavor and semi-sweet chocolate proves to be the best balance for the brown sugar dough. This recipe can be made in a 8 x 8 square pan or doubled and baked in a 9 x 13 pan. The 9 x 13 pan of cookie bars will need to bake a few minutes longer so watch carefully. Let the bars cool for at least 10 minutes before cutting into squares, to allow time to set up. TIP: I suggest using an aluminum pan. This recipe does NOT work as well in a glass pan. 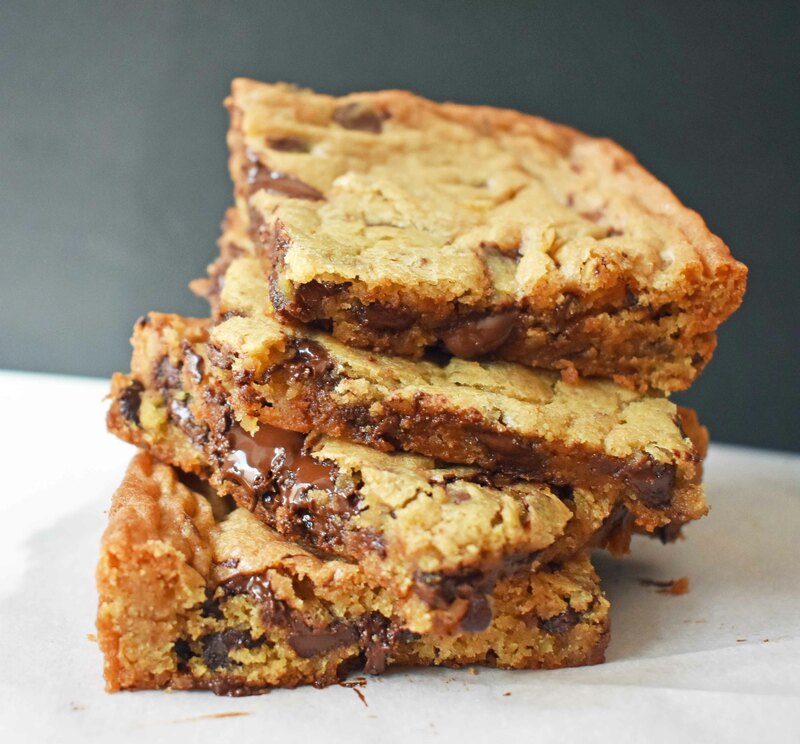 Classic buttery chocolate chip cookies in a bar. So easy to make! Cream butter, brown sugar, and sugar for 4 minutes, until light and fluffy. Stir in egg(s) and vanilla and mix well. Stir in flour, baking soda, and salt. Stir until incorporated. Bake for 28-34 minutes, or until light golden brown. Let cool for 10 minutes before cutting into squares. *** I suggest using an aluminum pan. This recipe DOES NOT work as well in a glass pan. It’s a GUARANTEE that you will LOVE these Chocolate Chip Cookie Bars. Find me on Instagram at modern_honey. I would love to hear from you! I just made these bars, and they are unbelievably good! This is the first recipe I’ve tried from your site, and I absolutely will be back for more. Thank you for such a great recipe — you’ve made my whole family happy! I just put this in the oven. Hopefully, I wasn’t suppose to grease or flour my pan. I just made these bars and they are unbelievably good! This is the first recipe I’ve tried from your site and I absolutely will be back for more. Thank you for a great recipe — you’ve made my family very happy! Yay! I am so glad that they turned out and you loved them. Thank you for taking the time to spread positivity. I appreciate it! Is the cooking time the same whether you make in 8×8 pan or 13×9 pan? Hi! Since the cookie bars will be thinner in a 9 x 13 pan, you will want to reduce the baking time. I would set the time for 5-10 minutes less and just watch them. Hope that helps! I made a 9×13 and set the timer for 23 minutes since you said to to do 5-10 less for 9×13 and could tell it wasn’t done at all in the middle. So I baked it for 29 minutes and took it out because the edges were getting quite dark but even thought the middle was light brown, it wasn’t done at all. It was super gooey (not done at all) in the middle and the edges were quite crisp. I don’t know what I did wrong. I used a glass pan maybe that was my problem. I’m bummed because this was to go to our family Christmas tonight. I also used a glass pan, and had the same experience. I ended up baking them for 34 minutes at 350 plus an extra 10 at 300. They’re not cool yet, but they’re solid enough to sneak one. (I ate with with a fork. 🙂 I’m thinking once they cool, they’ll set into a more chewy bar. I’ll probably bake these at a lower temp for longer if I make them again — maybe split the difference and bake at 325. I made these using a glass Pyrex 9 X 13 and added 2 extra tablespoons of unbleached flour … plus cut the granulated sugar back to 3/4 cup & added pecans. I also do not buy brown sugar, but instead add 1 tablespoon of molasses to granulated sugar for every cup of brown sugar called for. Very good. These bars were what the chocolate chip cookie of my dreams tastes like. Better than any chocolate chip cookie I’ve ever made, and I’ve made a lot. These were soooo good! Yay! I love to hear that, Candin! A chocolate chip cookie bar is one of the best things ever. Thank you for your nice comment! Just pulled up this recipe and new to your site. And it’s exactly what I am looking for==and thank you so much for showing the ingredients for the 9×13. In a hurry to bake them for a bunch of youth and be there in a couple of hours. Appreciate the recipe already! Thank you! Hi Gail! Thank you so much for trying out the recipe. I hope you loved them! 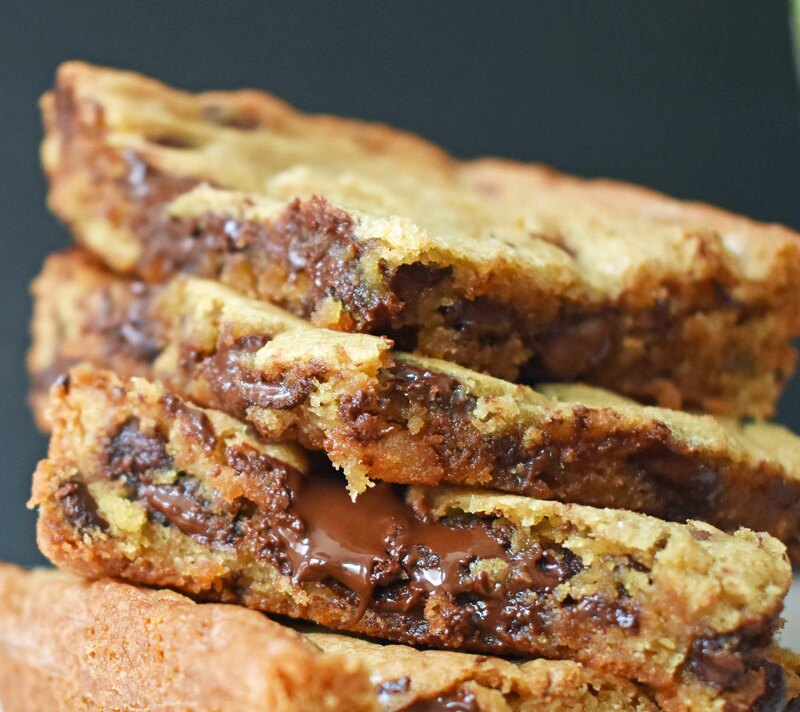 My husband doesn’t want me to make chocolate chip cookies anymore… just these!! Sooooooooooooooooooo good!!!!!! Smart husband! Thanks, Shawna. So happy you guys loved them. Thank you for trying out the recipe! Do you need to grease the pan? I line the pan with parchment paper. Not sure about greasing the pan. Hi Gina! Since it has a hefty dose of butter, you don’t have to grease the pan. Parchment paper works like a charm since it makes them so easy to get out of the pan. Hope that helps! Hi Michele! Happy to hear that it was easy and you were happy with the result. Thanks! Could this recipe be used for a cookie cake decorated with buttercream? Hi Michelle! Absolutely. It would be fabulous! You may want to 1 1/2 times or double the recipe, possibly, depending on the size of your pan. Good luck! THANK-YOU for 2 sizes of this Recipe. Cannot wait to try this recipe!!!!!!! Is the 8×8 going to be thin or not ??? Your butter should be softened slightly but still chilled, not room temperature. I love this simple recipe for cookie bars! It was so easy to make and tasted absolutely delicious! Hi! I was wondering for measuring the flour for this and your other recipes…do you dip your measuring cup into the packed bag of flour, or do you spoon the flour into the measuring cup for a less-packed cup of flour? I never know what to do. Thank you! I made these yesterday and they were super delicious. This recipe is a keeper. Last night I was going to have dinner with a friend, leaving my husband and kids at home with leftovers. I figured it would go over easier if I made them a yummy dessert. So I googled “easy cookie bars” and found this recipe. It looked easy enough, indeed, so I went for it. I made the larger recipe, in the 9×13 pan. I melted the butter (to save time and because I almost always melt butter when I make cookies). I used a combo of dark chocolate and white chocolate chips, and I threw in some chopped pecans. I think the baking time ended up being close to 40 minutes, but the two under-done ones I sneaked out of the pan early to take to my friend’s house were gooey and awesome. So, either way…. These are so good—better than the recipe for cookie bars on the back of the famous chocolate chip brand package (you know the one I mean, in the yellow bag!). I will make these again and again. Thank you for sharing the recipe with the world! I made this tonight. Good flavor but they seem very greasy. These turned out amazing!! 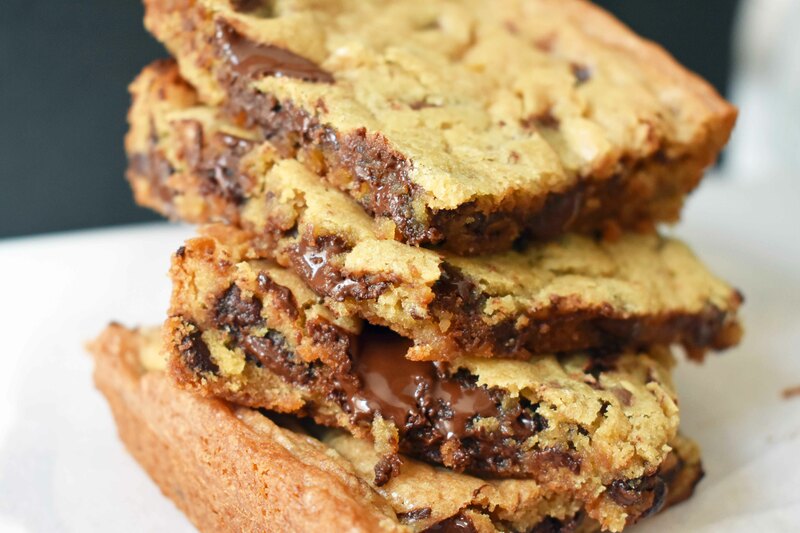 I tried it with a layer of Nutella in between a top and bottom layer of cookie dough and they were delicious. Do you grease if you don’t have parchment paper?? Hi there just wondering how abouts you think it would work if i were to use a brownie tray to make them? These are just whatI was looking for! The 8 x 8 size is just right. They taste amazing! Thanks for this great recipe! I am so glad to hear it! Thanks, Donna for trying the recipe! I made these two times now in a metal 9 x 13 pan. I did spray the bottom with canola oil. I baked them for 34 min at 350 degrees. They turned out FANTASTIC! My entire family loves them! Thank you! I made these this afternoon to use up some whole wheat flour i had laying around – AMAZING. Threw in some walnuts i had too. Wow. So good. thanks – sending this along to my friends. i make a chocolate chip cake the family loves but the chips all to the bottom. is there something you can do to keep this from happening? Scrolling through comments for this recipe and saw your question… When I add chocolate chips to cake, I mix them in with the flour before adding to the egg and butter mixture. The light flour coating helps to keep the chocolate chips from sinking during baking. This is my new go-to recipe. My kids are obsessed with them, and they are the talk of any potluck I bring them to. The crisp, flaky texture of the top perfectly accents the gooey middle. I’m so glad I started following you—thank you!! Your recipe is amazing, wonderfull, delicious, French bakery is very good but your recipe is awesome. Chocolate chips cookies bars don’t exist in France. Thank you. Ciao from Positano, Italy! Made your bar and my son DEVOURED it. We all loved it. Thank you for sharing! Hello! I’m making these for the second time today. I thought the first time they were too tall in a 9×13, so this time I’m doing them in my giant baking pan, which is probably about 11×15. Really great flavor!! Thank you!! This was a truly delicious recipe! I made it in an 8×8 pan and it took 33 minutes to bake. I’ll definitely made it again! Hi Elizabeth! You will need to adjust the baking time since they will be thinner. I would suggest reducing the baking time by at least 5-7 minutes and just keep checking. I keep my oven light on and watch for those light golden edges to start to form. You don’t want to overbake these as they are supposed to be ooey gooey so watch carefully. Good luck! Easy to make and taste great. Only thing is the butter. This could be cut back a couple tablespoons. There was an oily mess at the bottom of the pan. I use a silicon pan so a lot of oil isn’t needed. Do yourself a favour an invest in some silicon pans. Thanks so much for trying the recipe! I am so glad you loved it. They are definitely rich and buttery without a doubt. Have a great day! These are so simple, but everyone I have ever served them to can’t get enough of them. I’ve had several people ask me for the recipe, and even more beg me to make them again. I use Ghirardelli bittersweet chips and they perfectly compliment the gooey sweetness. The first time that I made these I used parchment paper. My sister tried lifting them out of the pan before they were cooled because we couldn’t wait, and the entire pan landed on the floor. Needless to say we scooped them up and ate most of it anyway, and didn’t regret it one bit. These will forever be referred to as “floor brownies” in our house. Thanks so much for this recipe, I’ll be making these for my family for years to come! Super delish! I made them in a 10×10 sheet cake pan and baked them for 28 minutes. They’re gooey and yummy, but not underbaked. I did reduce the sugar by 1/4 cup each – so 3/4 C each of white sugar and brown sugar, rather than 1 cup each – and they are still very sweet and caramalized; you could probably reduce the quantities even more. Just made these for Christmas…. my kids loved them!!!! Had to cook an additional 5-10 mins because it was not done in the center. Otherwise a great recipe! These are amazing! Great to ship to my sons in college. They love them! My husband loves them as well. I actually have a batch going right now. Thank you for this wonderful ad easy recipe! Just made these as per the recipe and they’re great. Thanks for sharing your recipe.